"According to one veteran mechanic, "In 1972, when those cars came into the dealerships for their first service, we would remove the '350SL' emblem and replace it with a '450SL' emblem." Who says it can be referred to as both now? I missed that official proclaimation. Actually it's a 350SL - that's the way it was titled and badged. But my point was, which was just an opinion, that when you're selling a nice example at a hopefully premium price, probably to a knowledgeable collector or enthusiast, you're likely better off with the correct badging. On the other hand if you were selling a $2500 clunker out of a trailer park you might be better off with the "450SL" misbadge. It's the 350SL badge that sets car apart from the 73-80s, which are pretty much the riff-raff of the 107s. I say they can and are referred to both ways now. Read some ads. '73 "riff-raff"? Can you tell me the difference between the '72 and '73? I own a '72 manufactured 2-72 and a '73 manufactured 11-72. Been through them thoroughly. From looking at Ron's 220 thread, I suspect that like me, he gets a lot of his pleasure through the journey and not just in the destination. I hope that he finds a new project to inspire us with. I have no doubt some dealers changed badging, i would suspect always with the customer permission. Clearly that directive did not come from the factory. Mercedes still calls the car a 350SL. Changing a badge doesn't change the name of a car. What makes later 450SLs undesirable, and widely viewed as such in my experience, is the loss of horsepower and the unsightly U.S. bumpers. I still say U.S. 350SLs are neat, be proud of what you have. That one year is often considered the second most desirable 107 behind the 560SLs. The '73 is exactly the same as the '72. Bumpers etc. That's a lot of assumptions but the fact is that a 107043 is a 350SL and the 107044 is a 450SL. The earliest cars were badged 350SL's because the 450SL had not been released in the home market. Aside from the badge, there is no difference between a US 350SL and an early US 450SL (pre 74). They both had vins starting 107044, the vins did not reset when they started badging them as 450SL's, the engines did not change (4.5's were sold in the US in W108's for a couple of years before the R107), the transmissions did not change and the bumpers did not change. It was the same car except the early cars had a 350SL badge on the trunk lid and a 450SL badge in the glove box. Things started to change in 74 with the larger bumpers, then cats, then CIS etc. The Euro 350SL (107043) had a different engine and a different gearbox (4 speed auto instead of the later 3 speed). It may be more desirable if you find one in similar condition. The Euro 450SL also had a different engine which made more HP then the US 4.5 (225hp vs 190hp) so it's not apples to apples. It's just a badge, and it's not technically incorrect. Besides, it's his car, if he wants to paint it pink and put sheep skin dash covers, he can and be just as proud of what he has. Check out the W114, W115 enthusiast website. That's not true, the horsepower loss was in 73, the bumpers in 74. Only 72s are good on both, and the vast majority of 450SLs were bad on both. Last edited by deanyel; 04-04-2012 at 11:25 AM. Euro 350SLs were 043, U.S. were 044s, but that says nothing about the name of the car. Indeed he should do whatever he wants. My only point was that, in my view, when you go to sell a nice example of a collector car correct badging is a wise move. In my experience collectors cringe at a misbadge - not the cost of rebadging but the fact that it says "I'm an amateur owner". I know mostly German collectors but they are a prospect for such a car. At this point, according to the original post, he's not just an owner, he's a seller. The earliest cars were badged 350SL's because the 450SL had not been released in the home market. That wasn't the reason for the name or name change in 73. Europe got nothing but 3.5 116 motors for years. I thought I sent you the magazine articles from the era. Disregarding the badging (and Panda's car is beautiful) weren't the wheel covers painted the same color as the car itself? The Wheel Covers usually match the hardtop color (two tone body/hard top was an option). Perhaps he just likes the look of black better. Europe got 350SL's for years but they got the 450SL in 73 which is why 72 450SL's were badged as 350SL's in the US. No matter how you slice and dice it, if it's a 107044, it's a 450SL as it shows in EPC. But we're going off topic so if you'd like to discuss this further, id be happy to in another thread as I suspect that Ron's intention for starting this thread is for selling his car. - 72 (up to some point) had a 350sl badge, and 73 got the 450sl badge, even though both 72 and early 73 both have the 117.962 motor. - Some 72s have manual windows while it appears all 73s have power. I would think any other early-72-only features like the chrome shifter plates would make an early 72 more desirable, including the 350sl badge, even if it wasn't correct. These are things that a true enthusiast-collector will understand, but folks like deanyal (is that denial?) might mistake for more important features. If the car is an early VIN that should have had a chrome shifter plate, and a 350SL badge, it is easy enough to find those and install them to make the car "factory-correct" if that's what you'd like. I am an early-73 owner, and I've installed a chrome shifter plate, just because I like it, and I could. I keep the original in the trunk in a plastic bad with a note that explains what I did in the event I die before the car does. - The early 107s (1971 and 1972) were badged from factory as 350SLs. - The 1972 and 1973 NA 350/450 107s are very similar, but as Fonzi points out, there was an evolution and not everything is the same. When buying parts Chassis/Engine number can be important. 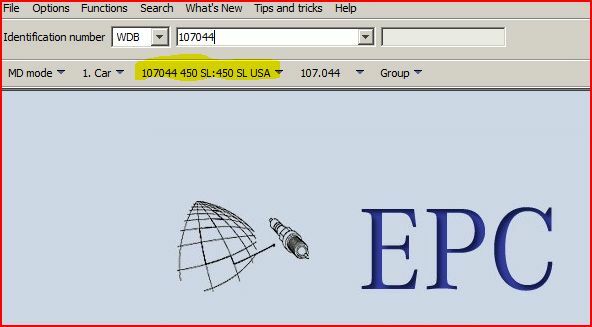 - EPC does call the 72 a 450SL, but that makes sense. Why have two designations for essentially same car? - All literature and service manuals that came with my 72 say it is a 350SL. - The data card attached below calls my 72 a 350SL-8 ! I think we all understand basically what happened. I am happy to use the 350SL 4.5 designation but many similar cars, like Ron's, were re-badged as 450SLs.